The Stó:lō Elders Lodge is an assisted living facility located in Chilliwack, BC. It is a ground level building with 15 assisted living suites for seniors and persons with disabilities. The Lodge adheres to the core principles of assisted living, such as choice, privacy, independence, individuality, dignity, and respect. The Lodge’s team of care professionals is dedicated to working with all clients. The Stó:lō Nation Elders’ Lodge envisions a place for senior members of the Stó:lō communities they can call “home,” and at the same time, receive the levels of care required. Food service: Two home-cooked meals per day (lunch and dinner), as well as snacks and drinks. Common areas: TV and large piano, seating areas by the fireplace, covered patios, multi-purpose room, and parking for tenants and visitors. 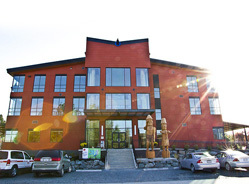 The Elders’ Lodge is a smoke-free and pet-free environment. Housekeeping and laundry: Regular cleaning and housekeeping of suites, weekly laundering of linens, bed sheets, and towels. Social and recreational opportunities: Varied and planned activities according to group needs, opportunity for interaction through the Tenants’ Council. Emergency Response System: Tenants are provided with pendants for emergency situations, a 24/7 emergency response system installed in each unit. Neighbourhood amenities: Within walking distance to shopping malls, food and grocery stores, and recreation areas.